Dave Adair Photography: "I don't want comfort. I want God, I want poetry, I want real danger..."
"I don't want comfort. I want God, I want poetry, I want real danger..."
~ the Savage, "Brave New World"
I love this quote so much I'm tempted to get it tattooed across my back. But that sounds a little uncomfortable; and maybe dangerous. (No irony there.) Maybe I'll get it printed on a t-shirt. Regardless, they are words to live by, especially when I'm feeling open and brave. After the last newsletter, where I wrote about my all-Czech bike trip, I visited with my old friend Bryony, who, last you heard, was becoming a nun. Well, that's so 2004. After a good seven years in the monastery, she's out and about now, has hair and visits friends in France, where I met up with her. We visited Montsegur (photos below,) where we first met. After a few days on my own I met up with Lucie again, and we traveled for a week in the Cevennes mountains. We didn't know where we were headed from one day to the next or where we'd stay the night. That's a delightful way to travel, if you have the time and get the chance. Recommended. 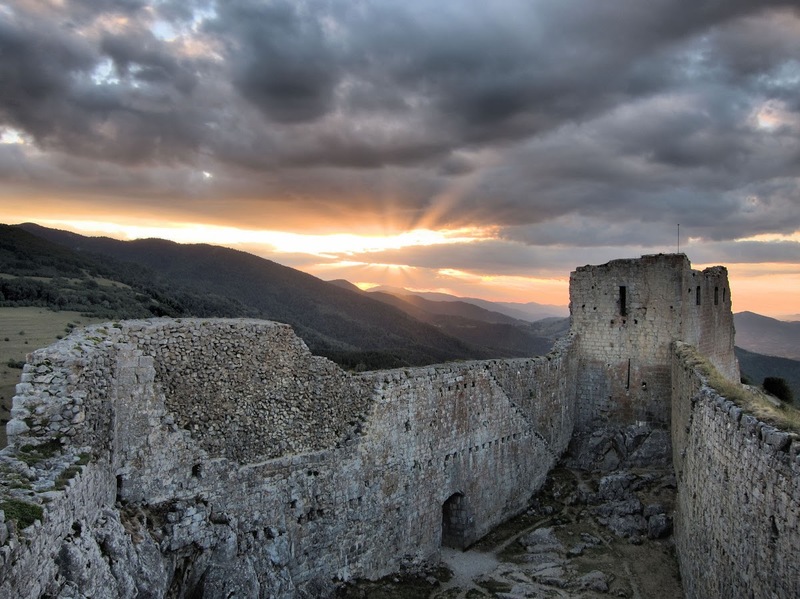 The impressive mountain-top fortress of Montsegur, one of the last hold-outs of the Cathars, a religion that dared to stand up to both the Catholic church and the King of France. Bad combination. After some nine months siege by up to 10,000 troops, those who refused to renounce their "heretical" beliefs were burned on an open fire - all 220 of them. This photo is an "HDR" image, combining three photos at different exposures. "HDR" stands for "Kinda Fake Looking." But cool anyway. Nearby is this intermittent spring, which cycles over a 90-minute period between a rushing river and a mere trickle. Something to do with natural siphons and suctions and whatever. When it's going full blast the stones steps are underwater. A canal boat in Carcassonne. Or is it a car, with a canal boat attached? I wild camped next to this little stream. LovelyLucie, back in Nimes. She's a good sport, that young woman. "Bullfights" are common in this part of France, but the bulls are only pestered and irritated - they aren't killed. Our first night of wild camping overlooking a beautiful valley. There was an amazing view from the top of this mountain. That's the Mediterranean on the horizon. An impressive canyon area called Cirque de Navacelles. You can see where a river had circled this little island in the ancient past. I've seen the same type of formations in Utah and Arizona. I found this really interesting. The pepper shaker must have been knocked over, and as it rolled it created that near-perfect semi-circle with the dots of pepper. A river cuts its way through the rock to form this canyon. Oh, these horses were fun and affectionate. This is a picture of Lucie before she had fleas. Or as she was getting them. We petted these horses, and later a dog, and the next morning Lucie was covered in flea bites. I escaped unscathed, which I attribute to good taste on the flea's part. The reason we smell so good here is cuz we just took a bath in the river. Another ancient little village in an improbable location. I'm telling ya, she's a good sport. Lucie was kind of excited that we had a flat tire, so she could help change it. This was a wild camping site, sort of. Technically it was a park you pay admission to get into. As we drove in at night through the exit (the entrance was closed) we were wondering why we thought it was OK. But it was. Down the hill from the van, we hiked through these great rock formations. The park is called "Montpellier la Vieux." Another HDR photo. One reason to use this technique is when there are strong shadows and very bright areas in the same photo. It allows for them all to be exposed correctly. I have no idea what Lucie is doing to this rock, but he seems happy about it. It's a really rugged landscape. Amazing cliffs rise on both sides of the Gorges du Tarn. The GPS indicates how windy the switchbacks are as we climb out of the canyon to look for a wild camping spot. That blue line is the Tarn River on the right side. A viewpoint from edge of the gorge. I can't imagine how long it's taken the river to cut into that rock. The next day Lucie insisted on us renting a canoe for a couple of hours. Fun! Our last night of camping before I took Lucie to Avignon. We had an amazing 360 degree view from here, and the stars were incredible. I thought I was really over caves. But now I'm so over being over caves. This Aven Armand cave was unlike any I've ever seen. Amazing! These stalactites grow at the rate of an inch per century. The tallest one is 100 feet (30 meters) tall. The cave is 4 million years old. I call this photograph "Love." But I call all my photographs that, so you can draw your own conclusions. I think we see what we're looking for. After dropping Lucie off at the Avignon bus station for her 20-hour trip to Prague, I went back to the fantastic Pont du Gard. Mind-blowing! After dark I took this photo from the same place where Lucie and I had swam 10 days before. I also saw three foxes as I walked under the bridge to this spot.